Yesterday Books-a-Million announced plans to install an Espresso Book Machine (EBM) in one of their stores.The pilot store will be located in Portland, Maine, and plans are in the works to place a second EBM in another location. 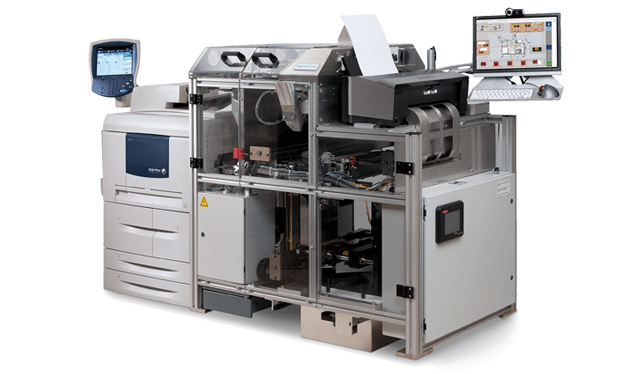 The Espresso Book Machine is a self-contained print ship which enables customers to order books from a catalog and have the books printed while the customer is waiting. It takes just a few minutes to produce a book, and the EBM can print anything from a MMPB to a trade PB sized book. One EBM model is pictured below, and as you can see it consists of a couple pieces of commercial printing equipment as well as the actual Espresso Book Machine (more details here). The EBM is supported by On Demand Books. That company has assembled an extensive catalog of titles from a wide variety of publishers, including Harper Collins, Hachette, Penguin, Macmillan, McGraw-Hill, Random House, W.W. Norton, and Simon & Schuster as well as a titles available via Google Books and ones distributed by Ingram/LSI. Naturally the EBM cannot offer all of the titles published by those publishers, but it does offer an interesting way for customers to immediately buy books in store rather than waiting or going to Amazon (which is the much of the reason why BAM! invested in a POD machine). Powell's Books, a chain based in and around Portland, Oregon, installed a similar machine in last year. You can find it in their flagship store, Powell's City of Books. There are also 70 other EBM installed in bookstores, libraries, and universities around the world. And in the not too distant future, similar technology will show up in Kodak Picture Kiosks. Kodak and OnDemandBooks announced a partnership last September to bring ODB's tech and catalog to Kodak's kiosks, though I have been told today that the new POD features are still under development. BAM! is currently the second largest bookstore chain in the US. This retailer also owns a book wholesaler as well as a couple other smaller chains, including the second-hand media store 2nd & Charles. That chain has 15 stores across the US ( with 2 more opening soon), including one in my area. My local 2nd & Charles set up shop in the space vacated by Borders, and is within walking distance of a BAM! store. I think that says a lot about the viability of brick-and-mortar bookstores, don't you? Do you know what BAM! doesn't have? An ebook platform. BAM! does have an ebookstore, but they never made the huge and showy capital investment in their own platform. Instead BAM! decided to sell Nooks and sell ebooks. At one point that seemed like a foolish idea, but in retrospect BAM! made a better choice than its larger competition. Borders invested in Kobo and then died. Indigo launched Kobo and then somehow found a buyer (thus escaping the need to finance hardware development). And B&N is struggling to avoid the demise caused in part by their mismanagement of the Nook platform. It's funny how the conservative choice turned out to be the best, isn't it? This post absolutely nails it. Developing Kindle and the Kindle platform has no doubt been en expensive undertaking for Amazon, and it’s still n0t clear whether it has turned a profit, or how much. (Last year they made about $600M of operating profit, on sales of more than $60B, and their net was actually negative). It needs scale, and B&N never got it. It also makes me wonder if Kobo will get there. In the end, focusing on retail was the only way B&N could survive. There is the “downside” that POD can only be bought from a website, but now that’s changing too. Bear in mind that Amazon’s reported profits are depressed by their massive investment in infrastructure. There are other kinds of profit that go beyond what beancounters track. Investment does not affect profit. Investment comes either from cash reserves (accumulated profits from previous years, mainly) or debt. Amazon could invest $100B in one quarter and it would not make a loss. Okay, they would loss money later due to the interest payments on that debt. I’m not sure how exactly Amazon is financing its investment, but they don’t need much money as it’s about $2B per year. Now that puts things in context: every time you hear how Amazon is “investing so much”, it’s flat wrong. Actually most investment (all most all) is capitalized since it has future economic value. That is a balance sheet transaction. However, then the cost of investment is “recovered” as a P&L transaction , depreciation or amortization over a defined period of time (per accounting and IRS rules). This is the P&L entry that will be part of the cost of goods sold. It is however possible that the investment may provide so much return (ROI) at such a rate that it actually increases profit in a given accounting period. BAM is obviously a lot more focused on “minding the store” than posturing or talking trash. Their “conservative” management is keeping them afloat while other, higher profie retailers are struggling. Their quiet ebook and POD investments show they are keeping an eye on the future but they aren’t panicking and rushing into unwise moves. They may yet outlast B&N and other ebook pioneers. can the in-store customer choose a font size and/or line spacing? I think you have to accept the font choices made by the publisher. No you can’t. Titles available for POD are all supplied as PDF files with fixed page layouts. Otherwise there’s no way to determine cover size for the spine width, since page count would vary. Since the contraption (you can’t properly call the thing a device) can print different sizes and thickness of books it would hardly be that much effort to offer up a few fixed choices, say three or four, at different prices. Might help sell a few books, too. That’s not at all practical for graphic layout and design. When you submit a title for POD production, you must first supply not only a page count, but also a paper weight and page size, and you are then provided with a template on which to lay out your outer jacket, with the spine and bleed includes in the dimensions. This must register within an eighth of an inch at most or it will be rejected, and even this is far less than offset printing requires. At the very most a publisher might provide a standard and an oversized font size layout for the visually impaired, but even this is only cost effective for best selling titles. On top of a setup fee for each file (cover and interior), there is also an annual fee to keep the title “in print” in the database, so three or four “versions” of a book will requires 6 or 8 setup fees and 3 or 4 times the cost to keep each one in print. Not worth it just to help sell a few more books, maybe. The EBM reminds me of the Hyundai Pony. It also looks like a poorly constructed robot. In Canada its a $150,000+ investment. It makes no sense, you’d have to run it day and night. After ordering books from Amazon and reciving POD copies I am not impressed at all with the POD industry. They have lowered the standards of books and contributed to the onslaught against quality.